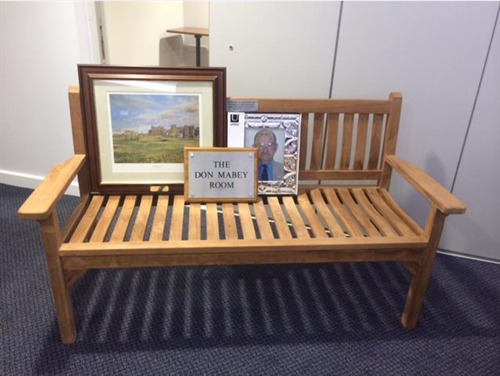 Don Mabey Room Declared at Seaford Head Golf Clubhouse! 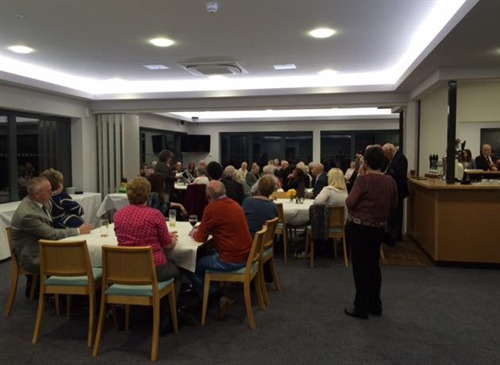 The Don Mabey Room was formally opened on Thursday 5th March within the new clubhouse at Seaford Head Golf Club. Don Mabey MBE was Freeman of the Town and known to many for all the work he did in and around the town and its organisations. Don was President of Seaford Head Golf Club, sadly passing away in December 2013 before the new building was completed. Seaford Town Council decided to dedicate a room within the new clubhouse in Don’s memory; the committee room is therefore now titled The Don Mabey Room. Approximately 80 guests attended the event hosted by Maeve Mabey. Speeches were given by family members and the Golf Club’s current President Alan Miller. Oliver Stanyard, Business Manager of the new clubhouse, presented Maeve with a plaque and Seaford Head Golf Club presented a picture. In return Maeve presented the club with a beautiful bench, which will sit proudly at the club in memory of such a remarkable man!